SSDs or Solid State Drives are the storage in tablets like the Apple iPad and Samsung Galaxy. SSDs use NAND flash, but fast NAND flash. NAND in SSDs has to be able to handle more read and write cycles than NAND used in USB Flash Drives or SD Cards. This is because the SSD is constantly accessed for data or drivers or OS functions. SSDs come in different forms. For this discussion, we will focus on SSDs using NAND. for tablets, ultrabooks, and laptops. Sidenote: NAND SSDs are used in Servers now because they use less power than hard disk drives (HDDs) that turn. The biggest cost for a storage/server farm with thousands of computers and disks is power and air conditioning. SSDs use 1/3 the power with 3 times the speed of a standard HDD. The SSD is more expensive than the HDD. While SSDs cost more, the money saved both to power the server room and cool the server room makes up for the more expensive SSD. SSDs started to appear in more notebooks about 4 years ago. These lengthened battery life and ran faster than HDDs. But the capacities of these SSDs were 64GB or 80 GB for $300. This was barely enough space to hold the files for Windows OS, Excel, Word, and Powerpoint, with almost nothing left for your files. The expense and capacity kept adoption slow. “…The change (to the Samsung SSD) allowed for read times to be upgraded to 261.1MBps, from 209.8Mbps, while write times were boosted to 209MBps from 175.6MBps.” from the Apple Insider. You could only buy a MacBook Air with an SSD. 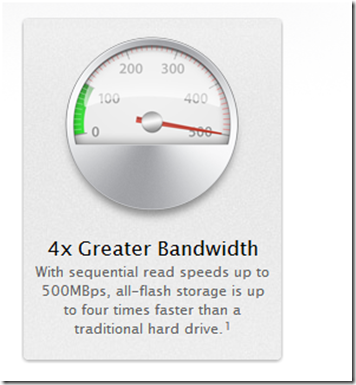 As of Monday, you have the new MacBook Air and Pro with SSDs advertised at Apple with 500 MBps read speeds. Again, you need an SSD like this to give fast startup times, and fast data access. You need larger capacity drives to store more data, and Apple offers up to 500GB SSD of storage. This makes this the laptop with the most standard SSD storage offered in the world, and it’s also the fastest. When do Solid State Drives (SSDs) replace Hard Disk Drives in PCs? I’ve debated with my colleagues many, many times that question, starting 3 years ago. I said, within 3 years. (This year). Well Apple has moved things along, so I’m sure this is the year. We have Ultrabooks and Apple both with SSDs, so we can expect SSDs to drop in price dramatically as volume goes up. This also means that we get faster NAND at lower prices. It also means we get more capacity, more NAND, more storage at lower prices. Think I was and am right. SSDs cross over this year. Apple has made sure the SSD is fast enough so it is NOT the bottleneck, not the limiting piece of hardware reducing the performance of the system. USB 3.0 is fast enough so now the SSD is not the rate limiter. Now you need to be sure to buy the faster USB 3.0 Flash Drive or USB 3.0 Hard Drive or USB 3.0 Card Reader to really move data quickly on and off your Apple MacBook Air or Pro. Apple users will buy lots of new USB 3.0 products to make use of the speed. Ultrabook makers will need to add faster SSDs to match Apple’s offering. NAND in SSDs will have to be faster. To the one person that gave me 5 out of 5 stars by actually visiting my Blog. Thank you. Also, check out this comic on the Electromagnetic Spectrum at xkcd. It shows where WiFi, Audio, and visible light, and gamma rays all fall on the spectrum in a humorous way. This post is filed under NAND Flash, SD, SDXC, Smartphone, SSD, USB 3.0.